rupa2nya, siyes sgt besh citer ni!! sarat dgn mesej berkenaan appresiasi alam sekitar..
Dr. Seuss's classic story about the power of hope is brought to life on the big screen. 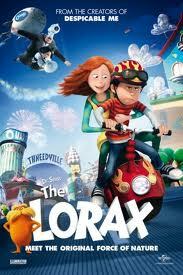 A 12-year-old boy yearns for the affection of the girl of his dreams but in order to get what it takes, he'll first have to discover the story of the Lorax, a grumpy but charming forest creature who fights to protect his little world. At the end of the story, the Once-ler reveals that he has one last Truffula seed left, and instructs the boy to start a new forest so that "the Lorax and all of his friends may come back." I x tgk lagi citer ni.....mcm best je. memang best kak. sangat2 seronok. mcam tgk musical theater kan... ada mesej tersendiri dan animation yang awesome. malam minggu lepas tgk kat capsquare, cuma 4 orang je satu hall. so rasa macam hall tu kite punya! betol2.. kartun dia sgt comel! hehehehe..